You are not required to install any software on your machine, (though you can optionally). CMP (Canadian Mind Products) checks all the submission websites daily with Xenu/BrokenLinks to make sure they are still operational and removes any deadwood from the list. Unfortunately, some sorts of malfunctioning site can slip through that process. If you find any, please let me know. No hassle setting accounts or passwords or key any hard-to-read captcha security codes. All is completely automatic. All you need to supply is the PAD url. This program avoids submitting to sites that have onerous restrictions such as demanding a back link. The program is open source (full Java source code provided for you to study or modify). There were at one time over two hundred hassle-free PADSites, but they have, one by one, gone out of business. I think part of the problem is the new ASP (Association of Shareware Professionals) centralised control of PADs (Portable Application Descriptions) has removed competition. If you are submitting a PAD 4.0 hosted at AppVisor you would put something like: http://repository.appvisor.com/app-5200f2cdccd0/site-01 in the top box and something like: Aquarium_Sand_Depth_Calculator_pad.xml in the bottom. If you are submitting a PAD 3.11 hosted on your own site, you would put something like: http://abc.com/pad in the top box and something like: aquarium.xml in the bottom. The key thing to understand is your pad must already be posted on the web. PadSites want to know where it is available now and in future on the web, not just on your local hard disk. To resubmit, submit to only selected sites, or submit without using a browser, download Submitter and use the companion SubmitBatch program. For this Applet hybrid to work, you must click grant/accept/always run on this site/I accept the risk to give it permission to talk to various servers on the net and to be able to recall what you have already submitted between sessions. If you refuse to grant permission, the program may crash with an inscrutable stack dump on the console complaining about AccessController.checkPermission. See this list of response codes to interpret the results. If you turn on the Java console, you can view the log of how the various websites responded. Normally you just get to see them until you submit another PAD. You can also manually submit to this list of important distributors. Normally you should only have to submit only once. The website will check your PAD periodically for any changes. If you download, there is included a batch version of the program called SubmitBatch that lets you submit a large list of PADs unattended. See the documentation on how to use it. The pad submission sites in general are outrageously rude and go to extreme lengths to pointlessly hassle programmers trying to help them by giving them software to list. They waste programmers time with all sorts of means to defeat automation, including Captchas, proprietary category schemes, forcing the programmer to pointlessly rekey fields already in the PAD. This is insulting and demeaning and in incredible waste of time of highly skilled people. Programmers have much better things to do that play mother may I mind games. Sites demand payment. They demand back links. They defeat the point of PADs by inventing their own validation rules. They are making money off the programming efforts of others but act like Queen Elizabeth I wanting everyone to kowtow to them. Without programmers, they would have nothing to list. They would have no visitors and no advertising revenue. The sites the mini PAD Submitter uses are the considerate ones that don’t go out of their way to make submission difficult. for the current version of Mini PAD Submitter. Submit ASP PAD program description files to 66 PADsites. 4.1MB zip for Mini PAD Submitter Java source, compiled class files, jar and documentation to run on your own machine either as an application or an Applet. access submitter source in repository with [Tortoise] Subversion client on wush.net/svn/mindprod/com/mindprod/submitter/. 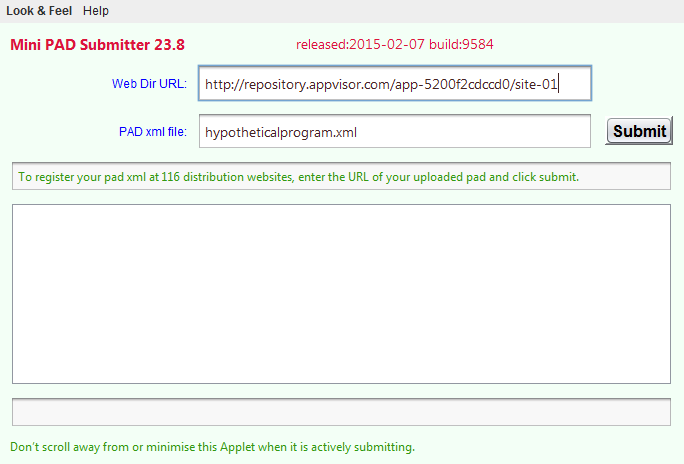 download ASP PAD XML program description for the current version of Mini PAD Submitter. Mini PAD Submitter is free. Full source included. You may even include the source code, modified or unmodified in free/commercial open source/proprietary programs that you write and distribute. Non-military use only.